How do environmental stressors affect the physiology, behavior, and ecology of phytoplankton and marine animals in relation to the marine ecosystem? 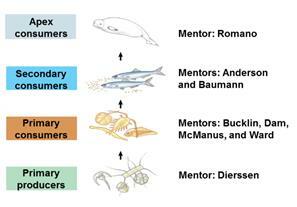 Each REU student, under the guidance of their mentor, will focus their research on an individual link in the food chain (see “Mentors and Research Projects” section and figure below). Each student will be expected to develop their own research question and project; be given independence but support to complete it. Throughout the program, students will come together to discuss how their results relate to those of their classmates in addressing the overarching question. Thus, students will gain an understanding not only of their individual research topic, but how a project contributes to the “big picture” of science as a whole. Each week students will participate in a different professional development workshop. The topics range from ethics, scientific writing, to data analysis. The two culminating events for the REU students will be oral presentations of their research to a scientific audience composed of members from the Mystic Aquarium and UConn, Department of Marine Sciences Faculty/Staff and an interactive poster exhibit symposium at the Aquarium for the general public. Each week, dedicated trips to the Aquarium will further reinforce the interrelatedness of each student’s project. Each trip (See below) will be led by a different mentor paired with an expert curator from the Aquarium, who will use the resources of the Aquarium to show how environmental changes can affect different systems. Students will visit animals and exhibits such as Beluga whales, penguins, and coral reef systems. Week 2: Aquarium: Primary Producers – How do stressors like ocean acidification and warming waters affect the base of the food chain? Week 3: Aquarium: Consumers – Could stressors that affect primary consumer populations affect apex fish predators? Week 4: Aquarium: Benthos – Why would mechanisms that uncouple benthic-pelagic interactions alter aquatic systems? Week 5: Career Panel Round Table: Mystic Aquarium and UConn – Students will discuss career paths with faculty and staff from the Aquarium and UConn. Week 6: Aquarium: Apex Consumers: Marine Birds – What are some potential anthropogenic and environmental stressors that have caused African Penguins to decline? Week 7: Aquarium: Apex Consumers: Marine Mammals – How are marine mammals “sentinels” of the marine environment? Week 8: Statistics II: Which test to use, Data analyses, Hypothesis testing – Students will learn how to statistically analyze their own data sets. Week 9: Presentation Guidance – Instruction on effective strategies for oral and poster presentations. Mystic Aquarium and UConn Avery Point are located in beautiful southeast CT. Surrounded by beaches, shopping, hiking, kayaking, and a vibrant nightlife. You may never want to leave!